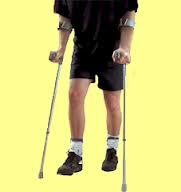 Paraplegia is a disturbance of neural function caused by either transaction or compression of the spinal cord. Complication of laminectomy and more. Hyposthesia or anaesthesia of lower limbs. In paraplegia special care must be taken to avoid formation of bed sores, contractures, urinary infection, faecal impaction etc. We treat the patient alternately in supine & prone position, and found results very much satisfactory.